The Montreal Canadiens are in the cellar of the Eastern Conference and that means they are a seller at the trade deadline. As of Monday, the Habs sit 15th in the East and 10 points out of a playoff spot. Although they can still mathematically make the playoffs, general manager Pierre Gauthier decided to look ahead to the future, by trading some of their current roster players. The Montreal Canadiens claim forward Brad Staubitz off of re-entry waivers. Brad Staubitz– A tough guy from Edmonton, AB, Staubitz will add grit to the Canadiens roster. 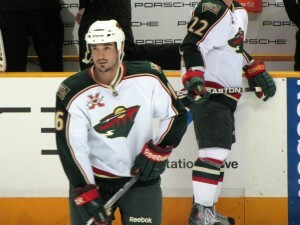 He has played 43 games for the Minnesota Wild in the NHL this year, racking up 73 penalty minutes. He has been playing in the AHL for the Houston Aeros for the last four games. He has appeared in 196 games, collecting 18 points and 432 penalty minutes. The 27-year-old might not make the Habs starting lineup right away, but he could definitely be a call up or be inserted into the line up if the Habs need some toughness. Staubitz, 6’1, 210 lbs, likely won’t back down to any other tough guys in the NHL. He can back up his words and his teammates. Montreal Canadiens trade forward Andrei Kostitsyn to the Nashville Predators for a 2013 second-round pick and a conditional fifth-round pick. Draft picks – Although the Canadiens could have gotten a depth player back from Nashville, general manager Pierre Gauthier decided draft picks were enough. The Habs obviously believe the draft classes will be strong in the next couple of years, so these second-round picks will hopefully work out well. It’s up to the scouts now. Andrei Kostitsyn– Flashes of brilliance but inconsistent play is what Habs fans have been used to while watching Kostitsyn over the last seven years with the Canadiens. He was sometimes in hot water with the coaches and never seemed to have a good relationship with any of them. He is set to become an unrestricted free agent this summer, so the Habs were unlikely to sign him anyway. The Belarusian native has had three 20-goal seasons in the NHL, but scouts thought he would be able to score more. The change of scenery will take some pressure off Kostitsyn and he will likely produce a lot more points in Nashville. And he gets reunited with his younger brother Sergei. Montreal Canadiens trade defenseman Hal Gill and a third-round pick to the Nashville Predators for forward Blake Geoffrion, forward Robert Slaney and a 2012 second-round pick. Blake Geoffrion – Nashville’s second-round pick in 2006 has spent the last two seasons bouncing between the NHL and the American Hockey League. The 24-year-old has played 42 NHL games, scoring five goals and adding six assists in that span. He is currently playing for the Canadiens farm team, the Hamilton Bulldogs and has seven points in four games. Geoffrion is a solid two-way player, combining power, energy and size (6’2, 195 lbs). He was born in Florida but grew up in Tennessee and became the second player from the American South to play in the NHL. Once he gains confidence playing in the AHL, he will be a third-line energy player with the Habs. His grandfather, Bernie “Boom-Boom” Geoffrion, played for the Habs for 14 seasons, and his great-grandfather Howie Morenz played for the team for 12 years – both Hall of Famers. Robert Slaney – The 23-year-old winger from Newfoundland went undrafted and has been grinding it out in the minors since 2009. Slaney had a successful junior career with the Cape Breton Screaming Eagles of the Quebec Major Junior Hockey League, leading the team in scoring in his last year. He is a big, strong forward (6’2, 203 lbs) and scouts say he displays strong puck possession skills, using his big frame to shield opponents from the puck. But he has struggled to produce points in the minors and isn’t quite defensively sound. Unless that changes, he will be a career minor-leaguer. Hal Gill– A big defenseman known for blocking shots, Gill was a player on the Habs blueline who was never flashy. At 6’7, 250 lbs, he was effective in the playoffs, shutting down the other teams top players, but his lack of speed and poor puck handling skills always made him a liability on the ice. The 36-year-old was prone to poor passes and getting burned by speedy forwards. He is a Stanley Cup winner who will add experience to a Nashville team. The Habs found him expendable since their depth on the blueline this year has increased with the likes of rookies Raphael Diaz and Alexei Emelin. The Canadiens won’t miss Gill.